A multicultural wedding can bring many challenges with it, and often, it all comes down to food! If the thought of providing your friends and family with a traditional feast that incorporates both of your backgrounds is proving tricky, then read on! Our Woodhall Manor wedding planners have helped arrange many multicultural weddings and are here to give you their top tips. In many respects, a ‘fusion’ option is the simplest way to go as it gives you the opportunity to embrace both your backgrounds by serving both styles of cuisine married into one. For both sets of family and friends, there are familiar elements they can identify and enjoy, but also the opportunity to try something new and enjoy a fresh take on something traditional. 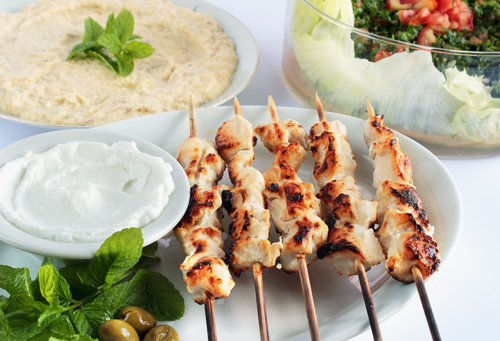 An experienced caterer will be able to incorporate your requirements and suggest a menu that will work for couples needing a cultural compromise. 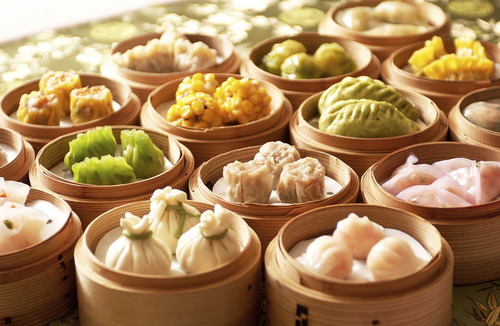 Many cuisines lend themselves to fusion dishes, particularly Asian cuisines that blend well together. You’ll find cuisines such as Thai, Chinese, Vietnamese, Indian and Japanese food all contain elements that can adapt and blend well to incorporate different flavours and spices. Then there’s the excitement of looking for a new fusion opportunity – who says a French / Russian blend can’t be a winner? Talk to your caterers as a priority and make sure you’ve got time to consider different options for your wedding catering. Think about the traditional elements that are most important to you that you’d like to be incorporated. Ask for a tasting event so that you can try the various elements from your menu, as it’s essential that you try the options before committing yourself, particularly if your requirements are complex or unusual. It’s also worth bearing in mind that the food is often one of the most costly elements of a wedding celebration so you want to be completely comfortable with your choices. 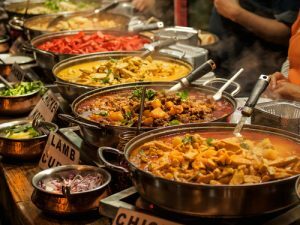 If fusion food seems too ‘way out’, or your mother in law will never agree, then you can always opt for the crowd-pleasing option of a buffet or street food style reception where guests can choose from a range of different dishes. This way, you can offer a wider choice than if you choose a sit-down meal, and guests can indulge themselves with as many (or as few) dishes as they prefer. If your Indian relatives will only eat Indian food, a selection of meat and vegetable curries can be offered in the traditional style with rice and freshly baked breads for them to enjoy. However, if your wife’s Turkish relatives will happily eat anything, they can enjoy the Indian selection alongside a range of traditional Turkish breads, salads and kebabs. If you’re keen to simply opt for a primary cuisine, but not forget a secondary culture, then you can always look to incorporate it in a different way. Recently, a Chinese bride married her Greek groom and the couple served the anticipated and highly traditional multi-course Chinese banquet. The guests feasted on Cantonese pork, hoisin duck, seafood soup as well as noodles and dumplings. To finish, everyone was handed a shot of ouzo and a bottle of Greek olive oil to take home as a memento of this beautifully blended union of cultures. Why not use your drinks reception to offer canapés that embrace yours or your partner’s cultural heritage? If spicy Thai food won’t go down well with all your guests, offering bite-sized nibbles gives everyone the chance to taste a new cuisine but if they don’t like it, they can politely decline and simply wait for the main event! If sweet treats are at the heart of your cultural heritage, then favours or a dessert table can be used to embrace your cuisine. 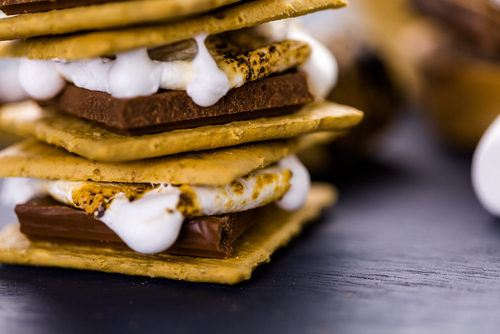 We’ve provided American families with S’mores, cookie dough and Oreo’s as part of their dessert table and served traditional baklava and halva to Middle Eastern couples and their guests as they enjoyed after dinner coffee. If you’re planning a cultural wedding and are wondering how to cater successfully for all your guests, give our knowledgeable wedding planners a call today. Why not arrange a private tour of our stunning country manor house while you’re at it! Give us a call on 01394 411288 or email info@woodhallmanor.com to find out more about Woodhall Manor.